Phew - a busy few days in which we have covered a large number of, admittedley very pretty, French kilometres. Rachel arrived at Brive Railway station on Thursday afternoon and we brought her straight back to Voutezac so she could look around the house and village while it was still light...she seems to have approved. 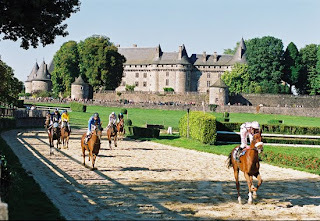 On Friday we took her to Brive, the centre of which is very attractive. It was warm enough to sit outside and have a coffee. From there we went South to Collonges la Rouge, officially one of the prettiest villages in France. After a very nice lunch we went to two other officially pretty villages - Curemonte, and then Turenne, the village we almost bought a gite complex in a couple of years ago. Saturday was even busier. First stop was Arnac Pompadour, a town about 20 minutes from us which has a Chateau which is used as one of the French National Studs for Arab horses, and also has a race course right in its centre. Then we went to Segur le Chateau and St Jean de Cole (two more prettiest villages and well earned). 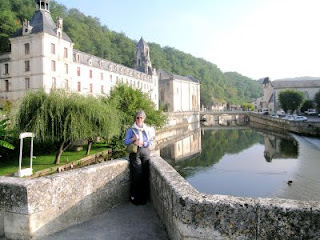 Lunch was in Brantome, "the Venice of the Perigord - that is it has a river running through it. However it is well worth a visit as it's Abbey is particularly photogenic. At this point it would have been wise to have gently worked our way home, but we decided to go the medieval town of Sarlat, which was a further hour and a half away to the South. 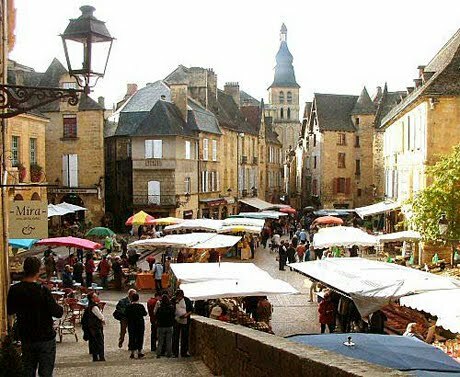 However Sarlat is always worth it, and we had a very enjoyable walk around and coffee in the main square. I think I can say it was tired but satsfied trio (plus the dog whose opinions were not canvassed) who eventually made it home. Sunday was busy again. After a trip to the Sunday Market in Objat (where we saw a basket of black truffles at only €50 per 100gm - surely the perfect thank you present?) we had to take Rachel to catch her train home from Bordeaux, as she wasn't able to get a ticket back from Brive. Bordeaux is over 200 km from here, but luckily its motorway all the way, and we hardly saw another car all the way - French motorways are quiet (and they ban HGVs on Sundays!). After lunch in the station buffet (not BR curly sandwiches) we saw Rachel off. On the way back we dropped in to someone I contacted out here who has Peregrine and Saker falcons - a very interesting meeting. She just breeds them, and doesn't hunt. It's much more complex here, but I hope I might get another hawk one day. Today we took another giant leap into Frenchness - the Disco is now on French plates. Thanks to Jean at the local garage for all his help. As well as fixing the problems I had with the car, and getting the car a Controle Technique (French MOT valid for 2 years),today he came with me and another English couple to the relevant office in Brive, where we handed in a number of forms and supporting evidence and a cheque for €180. On the way back Jean called the local car spares place on his mobile, and the plates were ready when we got back to Objat. He then fitted them for us - that's what I call service..